As a three-person team, we looked at the needs of international students at UC Davis and discovered that many have a hard time making friends in America. In order to help, we conducted interviews with students, operated camera and sound equipment, edited video clips using iMovie, and reached out to groups who would be interested in our video. The result is a video compiling advice from eight UC Davis students from around the world with some tips for international students trying to make friends in America. We will be sharing this video with SISS. Our Dynamic Duo consisted of just two students, but we were passionate about helping the elderly. A disease that does not get enough attention but is a major problem is Alzheimer’s/dementia, so working with the Memory Care unit at Atria Covell Gardens to come up with activities to help was a way for us to learn more about this issue. We researched what kinds of activities might help the patients and discovered that we had to completely change our plans as the patients wanted to do very different activities. Despite the change, our project successfully provided our Memory Care patients with an experience that brightened and stimulated their day and taught us how we could better serve them in the future. 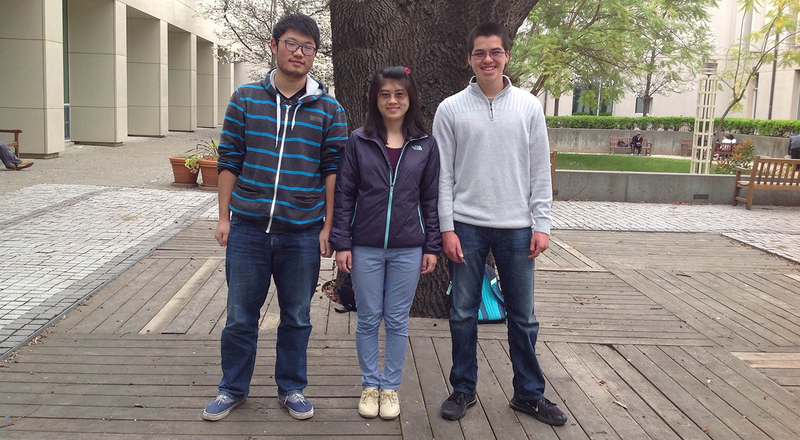 The Teaching Trio is a group of three students interested in exploring the field of education. Upon identifying a relevant current event that impacts students and other members of the academic community, the group members set out to create an educational video that aims to provide a factual context around the 2014 decision to increase UC tuition. The students gathered information from a wide range of sources to ensure that an objective perspective is adopted. Through the video, the Teaching Trio hopes to address the negative emotions people experience with the tuition hike by sharing helpful campus resources that support the needs and interests of the student body. A team of four undergrad students at UC Davis called, Bringing Learning and Joy to Davis, hosted an Animal-Assisted Therapy workshop on May 29, 2015. Our purpose is to bring awareness and outreach to students who are self-interested in Animal-Assisted Therapy. Through this Animal-Assisted Therapy workshop, students will listen to professional guest speakers in which they are knowledgeable in certifying animals and also share their experiences in the career field with Animal-Assisted Therapy. After listening to the professional guest speakers, the students will then take a trip to which they will engage in interactive hands-on activities with the domestic animals at the CETA Foundation in Vacaville, Phoenix Ranch. Our group, The Three Musketeers, sought out to educate students on how to cope with their stress through interactive activities during our Stress Busters Workshop hosted on May 11th, 2015. The workshop incorporated all five senses: Sound: Relaxing music played in the background. Taste: Lavender honey tea was provided. Touch: Sand stress balls were crafted. Sight: Succulents were planted and mandalas designs were colored. Smell: Lavender scented pillows were stuffed and sown. Following this workshop, Meditation Specialist, Chee Hoe, led an informational seminar teaching students basic meditation techniques. With the help and support from ASUCD Student Health and Wellness Committee, the Outreach and Peer Education Programs Director, Counseling and Psychological Services, the Mind Spa, and the Center for Leadership and Learning, we were able to provide both these services to students at UC Davis.